BMC is a leader in the business service management (BSM) software sector. They are the 20th largest software company in the world measured by annual revenue. BMC develops, markets and sells software to large real-time enterprises for data center automation optimization, IT services performance management and cloud computing management. A key product for BMC is their Remedy OnDemand cloud platform which administers and manages their service management software in the cloud on behalf of their customers. policy authorization approvals. The typical delay of 4 to 6 weeks presents a huge loss of revenue to BMC. 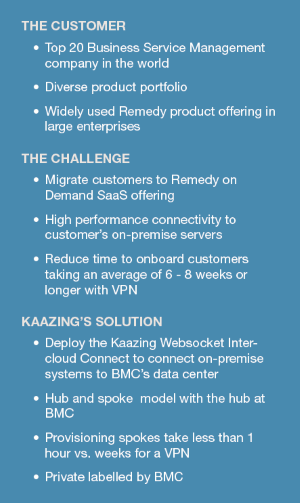 Kaazing’s technology in their “Client Gateway” and allows high performance network performance without the need for a VPN.